I have a three year old and a five year old and I want them to feel safe. Having said that, the media coverage of the impact of the terrorist attacks on America's children is sickeningly trite and leaves one with the impression that our school children are extremely coddled. I have been following Education Week's coverage of the terrorist attack "Terror Touches Schools," which has collected newspaper stories about terrorism and children from around the nation. Saw four or five Boys in Green lurking behind the hundred & fifty year old oak tree on Temescal Canyon Road recently. Their murdercycles were blocked from view by a block wall, half way up the concrete driveway of the old firehouse, lined up in platoon formation. Ready to zap and zip. John Law's radar gun was well hidden behind the thick trunk of the tree. He was the thickness of a rolling paper away from an illegal speed trap, but there he was, joking with the other motor officers, waiting for light to change. Waiting for the oncoming traffic. They'd already nailed a thirty-something chick in an old, dull gray Honda. All she wanted to do was drop the kids at the junior high school and get on to her slavin' job to get her pay. Effectively, that check will be about 70% lighter this week, on account of a $350.00 ticket for being maybe ten over. Couldn't have been much more than that, it's only a few hundred feet from the light to the speed trap. Kids'll be late to school, she'll be late to work. No matter. It ain't about safety. It ain't about traffic flow. If it was about serving the public, those motor officers would have been directing traffic a mile down the road at the three way signal by the junior high school, where traffic knots up like the four-level in LA. Directing traffic may serve the motoring public, but it doesn't do jack for the county and city coffers. Radar tickets are the perfect scam, an easy, lazy way to tax the public. Write a hundred tickets in a morning and you've generated a cool thirty five grand. DISCLAIMER: This isn't a personal beef, TWC was not ticketed. Although May can be windy and cold here in So Cal, rain is seldom on the calendar. Last night's rain wasn't enough to cure the drought, but it washed the dust off, freshened the air, and will help keep the green things alive for a few more days. The morning smells faintly of cottonwood and sycamore, more strongly of sage and anise. The anise aroma is from the natives we called licorice plants when we were vagrant Boy Sprouts. After the rain, the cool, damp morning brings the snails come out of hiding which gives me the opportunity for genocide. Killing things doesn't generally do much for me, but I do make an exception for laying waste to the snail population. I hate those things with a passion and I take an unseemly, perverse pleasure in crushing the little bastages. I lost track of the death count but I crushed them for fifteen or twenty minutes this morning. That was in between tossing the ball for Beanie Boy to fetch, so there is some time loss there. I'm sure I killed hundreds of the monsters, all of which are descendants of the snails that hitched a ride home on six-packs of annuals and gallon shrubs purchased at Home Despot and Lowes. No charge. Thankeee. Something that's rarely mentioned is the hitchhiking pests that spread like colds at an elementary school playground. And don't get me started on my infestation of nutsedge. That's a nasty weed that had to be one of the plagues dumped on the Egyptians. You can't kill it and after the nuclear holocaust there will be cockroaches and nutsedge. Did you know snails are cannibals? On the morning after the night before, TWC wishes you peace and prosperity. On this day in 1791 the Bill of Rights became a part of the Constitution. Bet you didn't realize it. Bet it will not be discussed at my children's school tomorrow. Bet the president will not acknowledge it. Bet EyeWitless News will not mention it. This law (Prohibition) will be obeyed in cities, large and small, and in villages, and where it is not obeyed it will be enforced. The law says that liquor to be used as a beverage must not be manufactured. We shall see that it is not manufactured. Nor sold, nor given away, nor hauled in anything on the surface of the earth or under the earth or in the air. Shortly thereafter, Grandma's fiance got himself erased in a fire fight with US Customs at the Canadian border while importing some high dollar whiskey. Though the murder rate rose during the teens, it soared to almost ten murders per hundred thousand people during Prohibition. Note the dramatic plunge in the murder rate that began on Repeal Day 1933. Prohibition also decimated the wine industry in California, pushing the evolution of high quality wines out for a half century and changing forever our cultural views toward alcohol. Many wineries collapsed because there wasn't enough market for Sacramental wine to make it profitable. Other wineries ripped out wine grapes and replaced them with juice grapes, resulting in a glut of low quality grapes that far outlasted the demise of Prohibition. Some growers, like the Mondavis, grew Zinfandel and shipped the grapes back east to Italian Catholics who were permitted to make their own wine for sacramental purposes. Guys like Ernest & Julio Gallo hooked up with the Chicago mob to sell wine made in clandestine wineries in Central California, shipping the finished product in tanker cars to Chicago. Prohibition made the Gallo family wealthy. That wealth and power carried through for generations, and today, Gallo controls a huge market share as a resuslt. Like our modern War on the Bill of Rights Drug War has done for the Mexican drug cartels, Prohibition provided vast sums of cash to people like Frank Costello (Boss of New York's Five Families) and his alleged bootlegging partner Joe Kennedy. One notable difference between then and now is the sheer scale of violence. More Mexican nationals have died from drug war violence in the last five years than perished during the entire Viet Nam war. In stark contrast, neither Bud nor Coors killed anyone this year. 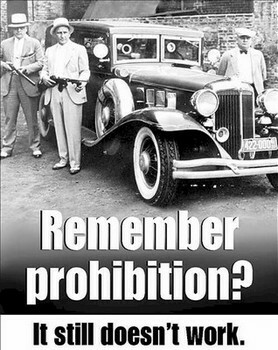 Modern America missed the lessons of Prohibition. The US spent forty billion dollars last year to stop people you know from snorting a little coke at a party or relaxing in the spa with a joint. Forty billion dollars down a rat hole of corruption, deceit, and death, yet anyone who wants drugs can buy them. Let's celebrate Repeal Day with a glass to your health, friends. Check out the L.E.A.P website for some good documentation and information on America's longest war.